Summer has arrived and to celebrate, the Scottish Friendly Children’s Book Tour is heading up to the Western Isles, to dip our toes in the turquoise waters with fantastic author and illustrator Laura Ellen Anderson. 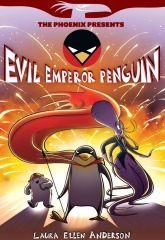 To celebrate Laura’s upcoming tour, we are giving away a signed and dedicated copy of her brilliant Graphic Novels Evil Emperor Penguin and Evil Emperor Penguin Strikes Back! the colourful, madcap adventures of an endearing wannabe evil penguin and his cute sidekick Eugene, who’s evil plans are constantly thwarted by his nemesis, Evil Cat! The closing date is Wednesday 17 May. To enter please add your answer as a comment below along with your name, who you would like the book to be dedicated to and email address. View full terms and conditions here. Laura is a hugely exciting talent in the world of children’s writing and illustration. She has illustrated David Solomons’ smash hit My Brother is a Superhero, as well as books by Peter Bently, Cerrie Burnell and most recently Terry Pratchett’s The Wee Free Men. She has come into her own as a writer and illustrator, first producing a range of adorable picture books for younger children alongside writing stories for the phenomenally successful Phoenix weekly comic. Her first graphic novel, Evil Emperor Penguin, came out in 2015. Evil Emperor Penguin, came out in 2015. 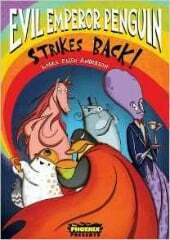 It features not your typical fluffy, kind-hearted penguin but a dastardly yet loveable megalomaniac with designs on taking over the world, constantly frustrated at being thwarted by his eviler nemesis, Evil Cat. Evil Emperor Penguin Strikes Back!